• Because the heavy-lifting takes place ahead of time, when the rub goes on and the racks roast in the oven for hours. Then the only thing that has to happen when the chaos—happy chaos!—descends is a slather of sauce while the ribs lacquer up on the grill. 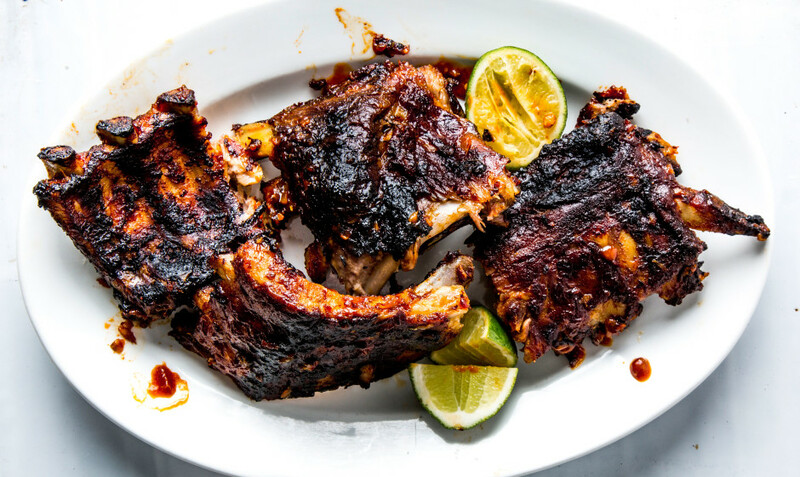 • Because there are endless sauce variations (sweet and tomatoey for the kids, smoky and spicy gochujang—a recipe we cribbed from Justin Montgomery and Chris Vergara, the chefs at our favorite local haunt Harper’s—for the grown-ups). • Because they’re absurdly good when grilled, and you can eat them with your fingers, a crucial element of summer cooking. Ooh these recipes is just what I needed, thank you!! I totally agree – when entertaining at home everything needs to be prepared ahead of time. That means a simple recipe, or staggering meal prep across the week. There’s nothing I hate more than my guests noticing me fretting away in the kitchen and feeling like they can’t relax. PS – This recipe looks stomach-achingly delicious! I’ve never been great at cooking pork ribs, I think it’s because here in Australia we don’t really have a “tradition” of it as you do in America but I’m definitely going to try this. You are correct about not fixing foods that take you away from your guests! It does seem a bit rude to invite people over and you’re in the kitchen for the majority of the time. Ribs are a yummy choice; choose your own sauce and get messy. And of course you can choose beef, pork, or lamb ribs. This post made me a bit hungry. And thanks for the restaurant recommendation too.